Bilal Kayed transferred to Ashkelon: "I did not go on hunger strike to negotiate, but for freedom"
In a meeting with lawyer Farah Bayadsi of Addameer Prisoner Support and Human Rights Association in Ashkelon prison on Monday, 4 July, hunger-striking Palestinian prisoner Bilal Kayed emphasized his determination to continue his hunger strike until freedom, despite frequent transfers from prison to prison, difficult conditions of imprisonment, and serious health impacts of his hunger strike. Kayed, on his 20th day of hunger strike, is rejecting all medical examinations, vitamins, and salt supplements. He was transferred from solitary confinement in Ahli Kedar prison to solitary confinement in Ashkelon prison on Sunday, 3 July 2016, reaching Ashkelon at 6:00 pm. He was previously transferred from Ramon prison to Ahli Kedar on 28 June, his 14th day of hunger strike. His legal visit was delayed because of the transfer from prison to prison. His cell in Ashkelon prison measures only 2 meters x 1.5 meters, has no windows or other ventilation, and contains a toilet and broken sink. The prison administration has rejected his multiple requests for a fan. When he was held in Ahli Kedar, his cell was frequently raided and he was subject to strip searches and body searches. After twenty days of hunger strike, he is tired, weak, dizzy and unable to sleep; despite this he is repeatedly made to stand for inspections by the prison administration. Bayadsi noted that despite the desolate conditions of his solitary confinement and weakening health, Kayed was in high spirits and greatly appreciative of the strong Palestinian and international support for his hunger strike. He is on strike against his administrative detention without charge or trial; a six-month detention order was imposed upon him on 13 June upon the expiration of his 14.5 year sentence in Israeli prisons. He rejected the order immediately, saying “If you refuse to allow me to live with dignity, then I will choose to die with dignity.” Kayed affirmed that “I did not go on hunger strike to negotiate; I went on hunger strike for freedom.” Kayed will face the Israeli Ofer military court tomorrow, 5 July, to confirm his administrative detention order. The order has not been confirmed and the hearing was postponed, on the last occasion because Kayed refused to attend or recognize the military court or the administrative detention process, denouncing the military court as illegitimate. Hundreds of Palestinian prisoners are engaged in short-term hunger strikes and protests in support of Kayed, and the Popular Front for the Liberation of Palestine prisoners have declared that they will start a collective hunger strike in early July if Kayed remains imprisoned. 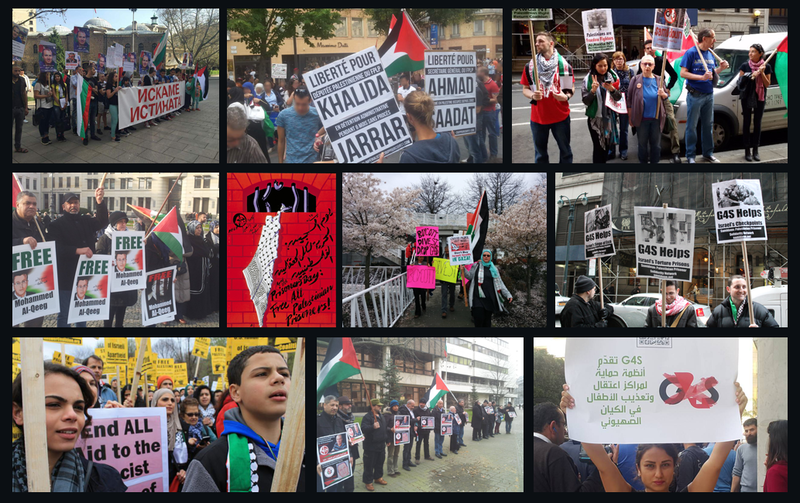 People around the world have participated in demonstrations and calls to action demanding Kayed’s release. Kayed is one of nearly 750 Palestinians held without charge or trial under administrative detention; issued for periods of one to six month, administrative detention orders are indefinitely renewable. Kayed’s administrative detention order was imposed upon the completion of his lengthy sentence, which Palestinian prisoners fear threatens a dangerous precedent.